1968 – Congress includes 77.6 miles of the Middle Fork Feather River, as one of the six original rivers protected by the National Wild & Scenic Rivers Act in 1968. Even though he was a big dam proponent for other rivers, Representative Harold “Bizz” Johnson made sure that the Middle Fork was included in the bill to stop a proposed hydroelectric project that threatened his favorite wild trout fishing stream. 1972 – The California Wild & Scenic Rivers System is established by the California Legislature and Governor Reagan. Like the federal system, state designation prohibits dams, requires management plans, and classifies various segments as wild, scenic, and recreational. The newly established state system totals more than 1,234 miles, including segments of the Smith River, Klamath River, Trinity River, Eel River, Van Duzen River, and American River. State designation kills a large dam project on the Eel River at Dos Rios. 1978 – Congress protects 26.3 miles of the North Fork American River in the National System. 1981 – In the last few weeks of President Carter’s administration, Interior Secretary Cecil Andrus, acting upon a request by California Governor Jerry Brown, adds most of the state system to the federal system, using a little-known provision of the National Act allowing Governors to secure federal protection of rivers upon approval of the Interior Secretary and without the approval of Congress or that state’s legislature. 1982 – In what can only be characterized as an angry response to Andrus decision, the California Legislature guts the California Wild & Scenic Rivers Act, limiting the area of protection to the first line of riparian vegetation and eliminating the requirement for state management plans. 1984 – Congress adds 83 miles of the Tuolumne River to the National System to stop a destructive hydroelectric project. The designation was included in the California Wilderness Act, which also protected more than 3 million acres of wilderness. 1987 – Segments of the Merced (111.5 miles), Kings (81 miles), and Kern Rivers (151 miles) are protected in the National System, killing a proposed hydroelectric project on the Merced River. Congress also reserved the right to approve a future dam on a portion of the Kings River downstream of the newly designated segment. 1987 – The state act is amended to provide for studies of potential additions and to direct the Natural Resources Agency to initiate studies of the East Carson, West Walker, and McCloud Rivers. 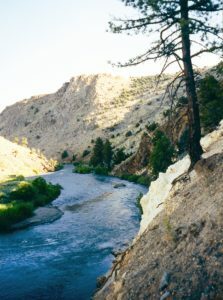 1989 – In response to studies and recommendations conducted by the Natural Resources Agency, the California Legislature adds 10 miles of the East Carson River and 37 miles of the West Walker River (along with one mile of Leavitt Creek) to the state system. Dams are prohibited on the McCloud River, but it is not formally designated. 1990 – Most of the Smith River segments that were state rivers added to the federal system by Interior Secretary Andrus are re-designated as Wild & Scenic Rivers by Congress as part of the Smith River National Recreation Area Act. 1992 – Congress passes the Los Padres Condor Range and River Protection Act. 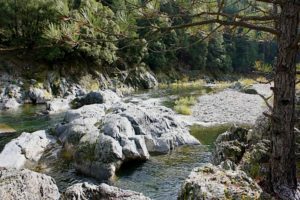 Targeting public lands in the iconic Central Coast region, the bill adds 31.5 miles of Sespe Creek, 33 miles of the Sisquoc River, and 19.5 miles of the Big Sur River to the National System. The bill also protects 400,000 acres of wilderness. The designation of Sespe Creek expands the diversity of the system by including, for the first time, some stream segments that flow seasonally but still possess outstanding values. Congress passes a separate bill adding 11 miles of the lower Merced River to the existing Merced Wild & Scenic River. 1994 – The California Wild & Scenic Rivers Act is amended by the California Legislature to require state agencies to protect rivers in the state system in the normal course of their regulatory duties and agency operations. 1995 – In response to studies conducted by the Natural Resources Agency, the California Legislature passes a law prohibiting dams on portions of Deer and Mill Creeks in Tehama County to protect their outstanding anadromous fishery. 1999 – The California Legislature adds 39 miles of the South Yuba River to the state system. 2003 – In response to a speculative scheme to divert fresh water from the mouths of the Albion and Gualala Rivers on the Sonoma/Mendocino County coast for transport in football field-sized bags to southern California, the California Legislature adds 3 miles of the Albion and 3.5 miles of the Gualala Rivers to the state system. 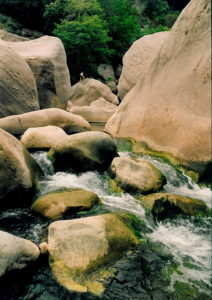 2005 – The California Legislature adds 31 miles of Cache Creek in the Coast Range to the state system. 2006 – After a 14-year hiatus, Congress returns its attention to California and adds 19 miles of the Black Butte River and 2 miles of its tributary, Cold Creek, to the national system. The streams were included in the Northern California Coastal Wild Heritage Act, which also protected 190,000 acres of wilderness in northwest California. 2009 – Several public lands bills are packaged into an omnibus measure, passed by Congress, and signed by President Obama. The omnibus legislation includes bills previously introduced by Republican members of Congress from California. This legislation protects 105 miles of rivers and 700,000 acres of wilderness in the Sierra Nevada, White Mountains, Mojave Desert, San Gabriel Mountains, and the San Jacinto Mountains of southern California. The protected Wild & Scenic Rivers included 19.1 miles of the Owens River Headwaters, 21.5 miles of Cottonwood Creek, 26.3 miles of Amargosa River, 10.2 miles of the North Fork San Jacinto River, 3.5 miles of Fuller Mill Creek, 8.1 miles of Palm Canyon Creek, 9.8 miles of Bautista Creek, and 7.3 miles of Piru Creek. 2017 – Senator Dianne Feinstein introduces legislation in Congress to protect 73 miles of Wild & Scenic Rivers and 329,000 acres of wilderness in the California Desert. 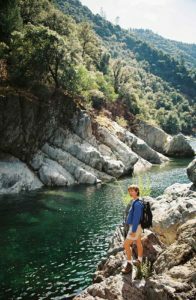 Rep. Salud Carbajal and Senator Kamala Harris introduce legislation to protect 158 miles of Wild & Scenic Rivers and 289,000 acres of wilderness in the Central Coast region. Rep. Judy Chu introduces legislation to protect 45.5 miles of Wild & Scenic Rivers and 31,000 acres of wilderness in the San Gabriel Mountains.